March 21st is arguably the busiest time of year for any parent, charity worker, blogger, campaigner or advocate who has, or has any connection with, someone who has Down's syndrome. Yes, it's World Down Syndrome Day! The date is chosen to represent the 3 copies of chromosome 21 that individuals with the condition have. It's a day of celebration, education, of support and sharing information, as well as fundraising for the charities we hold dear and this year the focus is on HEALTH. My darling friend, author and blogger Mardra Sikora described the day as being like a 'bull run' last week, and I know exactly what she means; there's fun and excitement, online crowds, jossling to see the action, bumping into people who will remain friends for life, possibly stepping on the odd toe or two, and all looking forward to a nice mug of sangria cup of tea when it's safely over. And as I sit to write this important post, there is so very much I'd love to cram into it that I'm not sure where to begin. So, I will stick to bullet points, signpost the nuggets we all need to be aware of, and provide a linky at the end for you all to join in with your relevent posts and thoughts on the event. are campaigning for Better Health Care for Adults with Down’s Syndrome. All adult members of the Down’s Syndrome Association will receive their own Health Book through the post during Awareness Week and they are asking everyone to take this letter to their GP. Membership for adults with Down’s syndrome is FREE. Join up online here. They have also updated their Health Information Series and encourage everyone to visit the website and download the relevant booklet. have created a compelling healthcare video in conduction with groups and medical professionals around the world, entitled Let Us In - I want access to healthcare. It's well worth a watch and sharing. and CoorDowns created a marvellous video a few years back, using actors with Down's syndrome in well-known TV commercials. This year they have surpassed themselves with this touching and unbelievably powerful message to prospective parents of a baby with Down's syndrome by those who have the condition. Please watch #DearFutureMum which includes our dear friend Sarah Gordy here, I defy you not to shed a tear as I and my husband do each time I play it. are doing our tiny bit to raise funds for the DSA, the charity that works so hard for us all. 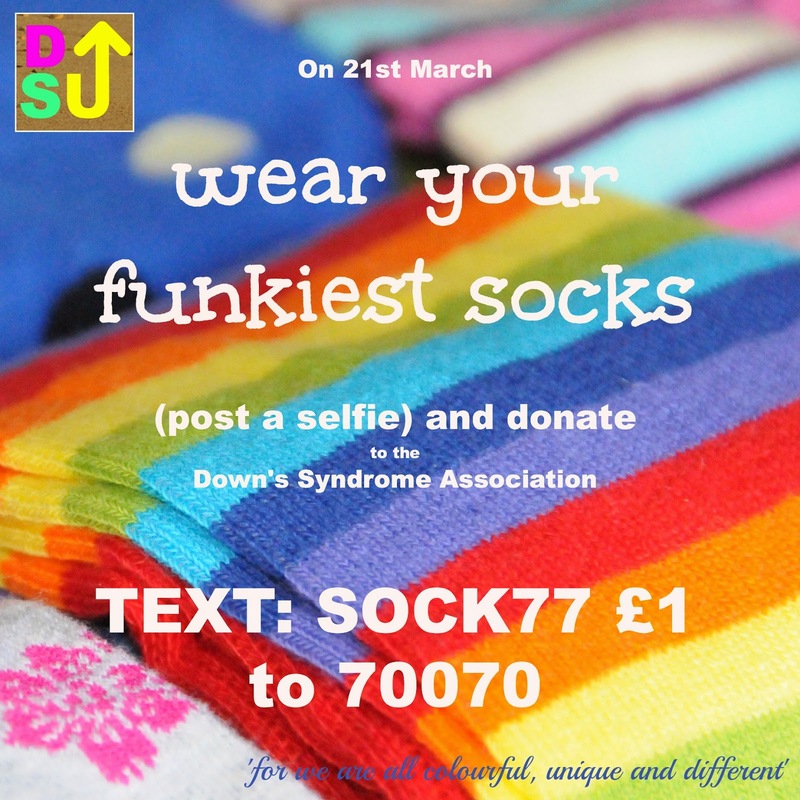 We are making full use of our online reach and asking everyone to wear their funkiest socks, share a selfie using #lotsofsocks, and donate just £1 via a text message. Text: SOCK77 £1 to 70070. People will be wearing colourful footwear worldwide to draw attention to this event, so if you can join in please do what you can to spread the word.